✓Size fit both hands or feet. ★ BOTH HANDS or FEET - Size is large enough to fit two hands or feet in at the same time. You can put nail gel on both of your feet and dry them out in one time without worrying about bumping sides and messing up polish. also the bottom part is detachable from the top part, it can be easily cleaned and sanitized. ★ TIMER & MODE Setting - Design with 30s/60s timer, 99s low heat/ high heat modes and heat dissipation hole. You can choose a proper timer according to your own needs and gel polish's requirements. Perfectly resolve all pain problems caused by curing gels, protect the machine from overheated. ★ SENSOR Design - Hand in, lamp on; hands out, lamp off. It can be started automatically by infrared induction if you put your hand into the machine without pressing time setting button. ★ SKIN & EYE Protection - UV shield gloves are packaged as a gift inside. Protect your skin from tanning. Comparing with ultraviolet light of traditional nail lamps, this light is closer to white light, which does no harm to your eyes. 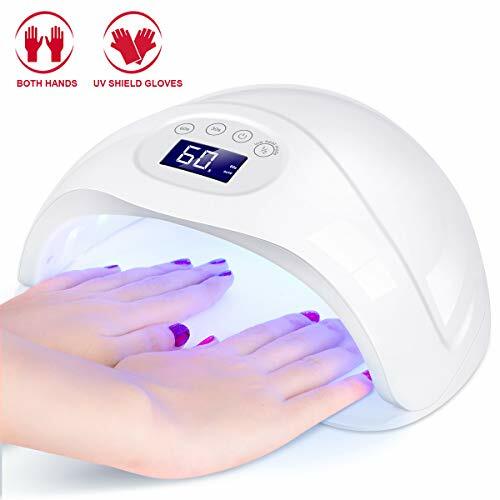 ★ UV LED & QUICK Dry - This lamp contains 24pcs long-lasting 50000hrs lifespan UVLED combined light beads with 48W power, which offers cure speeds up to twice as fast as standard UV LED nail lamp. And it can dry out all types of nail gel polish such as UV nail gel, LED nail gel, nail builder gel, sculpture nail gel and rhinestone gems glue etc. View More In Nail Dryers.